Do you want to Complain about Aadhaar Related Problems? Then you are in the right place.If you have applied for Aadhaar Card and have any kind of problem then you can complain it straightforward easily.So What are the things you can Complain about Aadhaar? Well, you can complain about a lot of things like Acknowledgement receipt not Provided, Form Not Available, Rude Operator, Corruption and other.It is an easy process which can be confusing when done for the first time, so follow me step by step.Without further ado, let’s get started. There are three ways to Complain about Aadhaar Related Services.1. By File Complaint Service of Aadhar.2. By Contact Number/ Email.3. By Post.I will talk about all of the methods and How you can complain using any of them easily. Just for you ease click on the method above which you prefer the most. Do you want to complain to Aadhaar Card Online? Well, yes that’s why you are here.Today I will share with you How YOU can complain about your Aadhar related problem easily.Without Further ado, let’s get started.1. Head Over to this Complaint Page of UIDAI saying Register a Complaint.Before you continue I just want to mention a simple note. 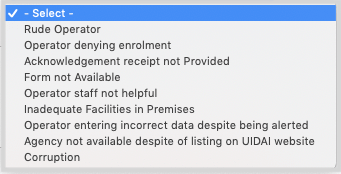 Note – If your complaint is related to something like Form Not Available or Operator Denying Enrolment which means that you don’t have an Acknowledgement slip, then Enrolment ID is optional otherwise Mandatory.2. Enter your Enrolment ID and Date-Time in the first Field. You can find your Enrolment ID and Date-Time at the top of your Acknowledgement slip. Your Enrolment ID is a 14 Digit Number and Your Date and Time will be in DD/MM/YYYY – HH:MM:SS format.3. Enter your Personal Details & Contact, Location Details like Name, Email, Mobile Number, Pin Code and Village/Town/City. If you Have your Registered Email/ Mobile Number then give that otherwise give what’s available. 4. Select Complaint Type as Operator / Enrolment Agency, Category as per your complaint and Write Remarks in 150 words describing your Problem.Note – Recheck that all your Information is correct. 5. Finally, Enter the Security Code and click on Submit and you will be redirected to another Page.Now you will receive your Complain ID which you must note and a confirmation page will appear stating that your Complaint is filed.Now you must Check the Status of your Aadhaar Complaint frequently to know the outcome. Do you want to complain UIDAI for your Aadhaar related problems? Then you are in the right place. You can Contact UIDAI by their Toll-Free Mobile Number and Email Address to file your Complaint Easily.UIDAI Toll-Free Mobile Number – 1947UIDAI Email Address – help@uidai.gov.inAfter you Contact them By Mobile Number or Email Address and file your complaint, they will provide you with a Complaint ID which you must note somewhere.After the Complaint has been filed, you must Check the Status of your Complaint Frequently to know the outcome.If you think that your Aadhaar is being misused and you want to complain about that, then first Track your Aadhaar Usage History. You can also complain Aadhaar Card by sending a Post at the Address Given Below. 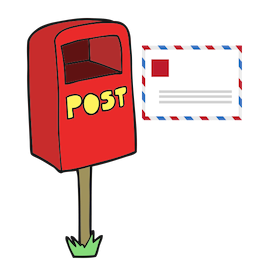 The Only con is that a post takes a lot of time, so if you something fast then the best option is either by Call or Online Service.If you love this Article then show your Wiseness by sharing it with your Friends, Friendly.